Louisiana Catahoula Leopard Dog - Skyler | Canine Training<p>by Mystic Moon, Inc.
Sky is an excellent example of what this "misunderstood breed" is capable of becoming. 1) great bloodline, 2) great environment, 3) great training, will lead to success. 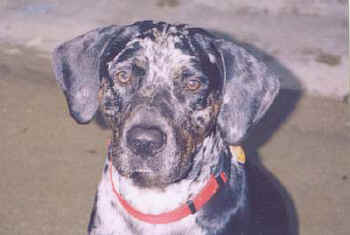 Louisiana Catahoula Leopard Dogs were bred to pursue, and drive livestock, (such as wild boar and cattle, oh my!) out of swampy county, in areas like Louisiana. Many potential dog owners are not prepared to deal with this breed's tough mindedness, amazing strength, endurance and high energy level. Sky is shown here at 5 months of age. Look at his huge jaw bone. These guys are considered the "pit bull" of the Southern United States. Sky's Advanced Obedience, and Public / Social Skills, are awesome. 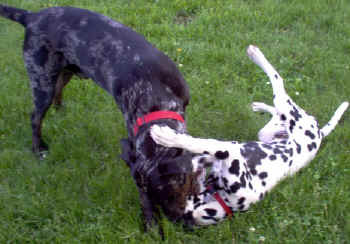 Especially for this Breed of dog. He also helps me train Clients' dogs, who have inappropriate behavior, whether aggression or fearful, toward family, strangers, animals, or other objects. He recognizes inappropriate behavior, and will gently correct/persuade another dog, just like a slow moving sledgehammer. He does it calmly, never growls or bites, just pursues them, and sets the example. I have never seen a breed/puppy that could do this. not to play bite so hard.